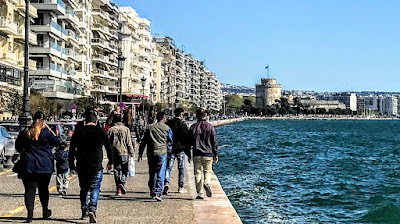 The walk along the seafront in Thessaloniki, from Aristotelous Square (Πλατεία Αριστοτέλους, Platia Aristotelous) to the White Tower is a popular stroll in the evening for residents, students and tourists alike. Aristotelous Square is the main square in the heart of Thessaloniki, and the like the White Tower it is virtually synonymous with the city itself. It is a venue for many cultural and political events, and is lined with hotels, cafés and bars. The two quarter-circle sides of the square are occupied by two culturally important and imposing buildings: the Electra Palace Hotel, where I stayed while I was travelling to and from Mount Athos in 2004, and the Olympion Theatre cinema, the venue of the annual Thessaloniki International Film Festival. Before the Great Fire that destroyed two-thirds of Thessaloniki in 1917, the city’s architecture of was more oriental rather than European, with many narrow streets and lacking any imposing façades, grand plaza or wide boulevards. In the wake of the fire, the square was designed 100 years ago in 1918 by the French architect, archaeologist and urban planner Ernest Hébrard (1875-1933), who proposed a number of large squares in Thessaloniki, including Aristotelous Square, which he planned to name after Alexander the Great. The Greek Prime Minister Eleftherios Venizelos commissioned Hébrard to redevelop the centre of this city. His vision was for a monumental axis for Thessaloniki, stretching from Aristotelous Square on the seafront to Venizelou Square and the Roman Forum. He wanted to name this axis after Alexander the Great, and to transform this into a city with boulevards and contemporary roadways, squares and parks. For his monumental axis, Hébrard drew on elements in Byzantine and Western architecture rather than Ottoman architecture, to stress the city's connection with the Byzantine Empire. This style is most evident at Aristotelous Square, with a few building facades implementing some of Hébrard's original ideas. Additionally, a statue of Alexander the Great was to be placed in the middle of the square. Hébrard designed the monumental axis so that looking uphill from the square we could see the Byzantine walls and the Upper Town. Facing out towards the Thermaic Gulf in the other direction, the square offers an outstanding view of Mount Olympus. On each side of his wide boulevard there are arched pedestrian colonnades, reminiscent of the colonnades in Bologna and Milan. But since he first set out his concepts for the heart of Thessaloniki 100 years ago in 1918, Hébrard’s designs have been modified and simplified considerably, and have never been fully completed. Most of the square was not completed until the 1950s, and the 12 key buildings that make up Aristotelous Square have been listed since 1950. When I visited Thessaloniki as the European capital of culture in 1997, there was much talk of the city’s plans to redevelop the square and the waterfront. But none of these grand designs would see the light of day, although many of the buildings have since been renovated and restored in the last 20 years. The statue of Aristotle was moved many years ago from the centre of the square to the side, and students say that if you hold the foot of the philosopher for a while some of his wisdom and knowledge will be passed on to you and you will pass any exam or test. Here and there in the narrow side streets of Thessaloniki, there are remnants of the Ottoman past, in Turkish inscriptions over lintels or in some of the surviving hamams or baths, and one singular minaret. But the heart of Thessaloniki owes its character to the imagination and vision of one French architect 100 years ago. I am staying in the Minerva premier Hotel at the western end of Egnatia Street in Thessaloniki, on the corner with Syngrou Street. 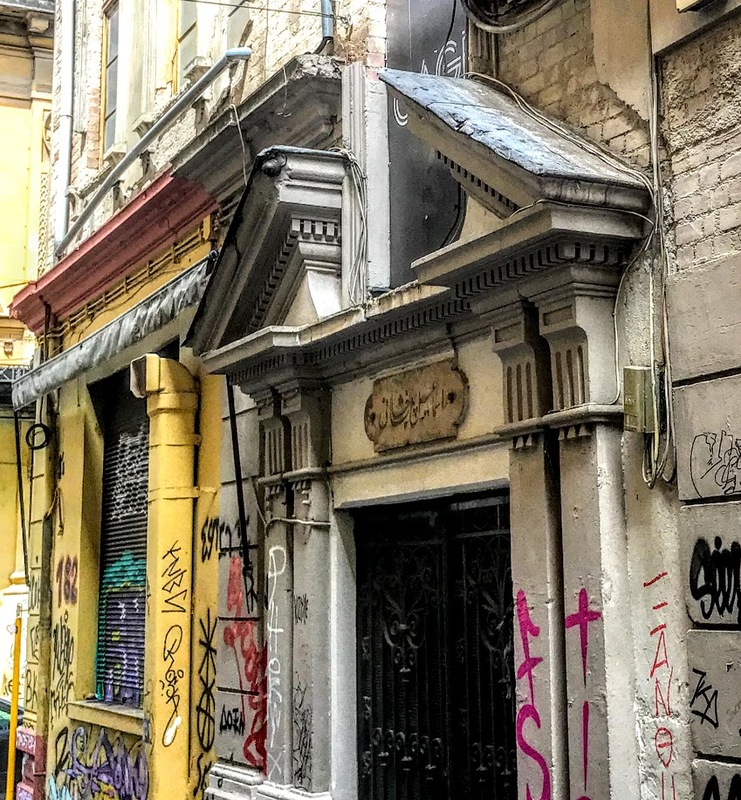 The name of Egnatia Street is a reminder that the old Roman road known as the Via Egnatia (Ἐγνατία Ὁδός) runs through the heart of Greece’s second city. The Via Egnatia was built by the Romans in the 2nd century BC. It crossed Illyricum, Macedonia and Thrace, running through territory that is now part of modern Albania, the former Yugoslav Republic of Macedonia, Greece, and leading to Byzantium or Constantinople, the eastern capital of the Empire. The Via Egnatia started at Dyrrachium (now Durrës) on the Adriatic Sea, and followed a route along the River Genusus (Shkumbin), over the Candaviae (Jablanica) mountains, and on through the highlands around Lake Ohrid. It then turned south, following several high mountain passes to reach the northern coastline of the Aegean Sea at Thessaloniki. From here it ran through Thrace to Byzantium or Constantinople, now Istanbul. This Roman road ran a total length of about 1,120 km. Like other major Roman roads, it was about six metres wide, paved with large stone slabs or covered with a hard layer of sand. The central arch spanned that portion of the Via Egnatia that passed through the city as a Decumanus or major east-west street. Strolling east along the Via Egnatia from my hotel, one of the most distinguished landmarks in Thessaloniki is the Arch of Galerius (Αψίδα του Γαλερίου) or Kamara (Καμάρα), an imposing statement of imperial power at what is now the junction of Egnatia Street and Dimitriou Gounari Street. The Roman Emperor Galerius commissioned the Arch and the Rotonda (Ροτόντα), 125 metres north-east, as part of the imperial precinct of his palace in Thessaloniki. The arch was built in 298 to 299 AD and dedicated in 303 AD to celebrate his victory over the Sassanid Persians at the Battle of Satala and the capture of their capital Ctesiphon in the year 298. Archaeologists have found substantial remains of the palace to the south-west. These three monumental buildings were linked by a road that ran through the arch, and that rose above the Via Egnatia: the Rotonda 125 metres north-east and the Palace complex 235 metres to the south-west. About two-thirds of the arch is preserved. It was built of a rubble masonry core faced first brick and then with marble panels with sculpted reliefs depicting the imperial victory. It was an eight-pillared gateway forming a triple arch. The central arch, spanning the Via Egnatia, was 9.7 metres wide and 12.5 metres high; the secondary openings on the other sides were 4.8 metres wide and 6.5 metres high. Only the three north-west pillars from the eight original pillars and parts of the masonry cores of the arches above it survive. The entire east side, with four pillars, and the southern-most one of the western pillars are lost. Extensive consolidation has been carried out using modern brick on the exposed masonry cores. The two pillars flanking the central arched passageway retain their sculpted marble slabs, depicting the wars of Galerius against the Persians. Originally, four vertically stacked registers of sculpted decoration were carved on each pillar, each separated by elaborate mouldings. A label for the Tigris River indicates that there were may have been labels on other representations as the builders deemed necessary. The sculptors used artistic license, so that Galerius is shown in personal combat with the Sassanid Shah Narses in one of the panels, although they never met in battle. A mounted Galerius is seen attacking a mounted Narses with a lance as an eagle soars above carrying a victory wreath in his talons. Galerius sits securely on his rearing horse, while the Persian Shah is about to be thrown from his horse. In the chaos of battle, terrified Persians cower under the hooves of the Roman victor’s horse. The relief showing the imperial family joining together in a sacrifice of thanksgiving may have been inspired by the Augustan reliefs on the Ara Pacis in Rome. Galerius’s wife Valeria, who was Diocletian’s daughter, is shown by his side, emphasising the imperial succession. But all the faces have been carefully chiselled off, by iconoclasts or later Turks in an act of cultural intolerance of images. In another panel, the tetrarchs are arrayed in togas as Nike holds a victory wreath over the heads of two of them. A third panel celebrates the unity of the tetrarchy, with the tetrarchs shown standing together. The way in which they are portrayed is similar to the statues of the tetrarchs in porphyry at Saint Mark’s Basilica in Venice. Only Galerius is dressed in armour, and he makes the offering on the altar. Despite the damage the arch has suffered over the centuries, it remains a statement of the power of Galerius in the Roman imperial system. When Galerius died in 311, he was buried at Gamzigrad (Felix Romuliana) near Zajecar in present-day, Serbia, instead of the Rotonda, which he had planned as his own sepulchre. The Rotonda, beside the Arch of Galerius, stood empty until the Emperor Constantine I ordered it converted into a church in 326. It remains the oldest church in Thessaloniki, and it is the most important surviving example of a church from the early Christian period of the Greek-speaking part of the Roman Empire. Meanwhile, the Via Egnatia was revived as a key road in the Byzantine Empire. Procopius records repairs by the Byzantine Emperor Justinian I in the sixth century, and almost all Byzantine overland trade with western Europe travelled along the Via Egnatia. During the Crusades, armies travelling to the east by land followed the road to Constantinople before crossing into Asia Minor. In the aftermath of the Fourth Crusade, control of the road was vital for the survival of both the Latin Empire and the Byzantine successor states.